1. The dredging contractor has completed their winter shut down. 2. Winter lake users are cautioned that the sediment pipeline used in the dredging project will remain in place in teh West Bay over the winter. 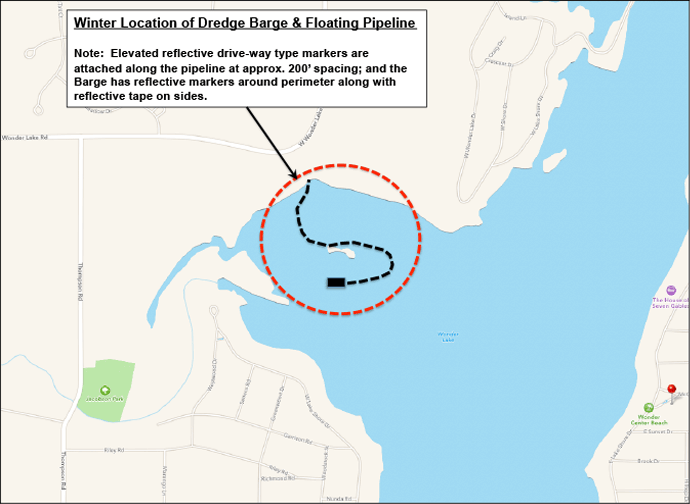 While much of the pipeline will be submerged below or barely protrude above the ice surface, the dredging contractor has marked the pipeline alignment. 3. The dredging contractor has provided an exhibit (below) showing the approximate location of the equipment left in West Bay for the winter. 4. Lake users are also cautioned that the dredging that has been conducted to date in the West Bay, creating deeper water depths, may also affect how ice forms in those areas. 5. All of the groundwater and surface water quality sampling events mandated by our IEPA permit conducted to date have documented that all the reqired standards have been easily met.